It handles custom errors for your routines. You can later run an error test and it will return true or false depending on the evaluated conditions. It also comes with a helper so you can quickly print errors and integrate it to your application very easily. It is a pair of a Class and Helper. The class will handle the error management, and the helper has some nice functions to echo your custom errors on the application views. Download the package, copy both files to your application directory and follow the examples. It works very similar to the Form Validation Class, so it wont be much trouble for you. The run() method performs a global check and verifies if an error occurred. It returns true when no errors are found, or false otherwise. The Error Validation Class has 3 functions (helpers) you can use to display the error messages: first_error(), last_error() and all_errors(). All the functions accept 2 parameters: the open tag and close tag. If empty, a paragraph tag will be used as default. You can use the above functions inside a view to display the error messages generated in your controller. By default, the Error Validation class adds a paragraph tag (<p>) around each error message shown. You can either change these delimiters globally or individually. I hope you find this useful. This isn’t a complicated class but it has been tested intensively. 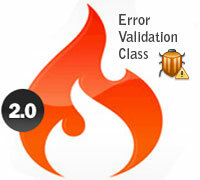 If you encounter an error caused by the class or want to suggest a feature, do not hesitate to comment below.